See more than 90 paintings and drawings by the French modern master, Henri Matisse, and one of the greatest post-war American painters, Richard Diebenkorn. Tickets: $17.50 for Adults, $15 for Seniors (65+), $10 for Students with valid I.D., $7.50 for Youths (7-18), and Children under 6 are Free. Members are Free. Outside guided tours, lectures, and presentations are not permitted in the Matisse/Diebenkorn exhibition. Diebenkorn (pronounced Dee-ben-korn) is widely considered one of America’s greatest post-war masters. His work can be found in almost every major U.S. museum collection, including The Baltimore Museum of Art, Dallas Museum of Art, The Museum of Modern Art, National Gallery of Art, Philadelphia Museum of Art, and San Francisco Museum of Modern Art. After achieving early acclaim as an abstract artist, Diebenkorn confounded his admirers by shifting to figurative imagery for several years before returning back to abstraction. He had a rare fluidity and independent style, often going against the grain of what was expected or popular at the time. Though Henri Matisse was his greatest and most enduring influence, Diebenkorn also held a lifelong admiration for the work of Pierre Bonnard, Paul Cézanne, Edward Hopper, Willem de Kooning, and Piet Mondrian, among many others. Featuring stunning pairings of more than 100 paintings and drawings, this gorgeous book brings together the work of Henri Matisse and Richard Diebenkorn as never before, offering new ways of understanding both artists. Essays by BMA Senior Curator Katy Rothkopf and SFMOMA Curator Janet Bishop highlight the ways Diebenkorn drew from Matisse’s example to forge a style entirely his own. An introductory essay by John Elderfield, Chief Curator Emeritus of Painting and Sculpture at The Museum of Modern Art and Allen R. Adler Distinguished Curator and Lecturer at the Princeton University Art Museum and an essay by Jodi Roberts, Halperin Curator of Modern & Contemporary Art at the Cantor Center for Visual Arts at Stanford University, round out this extraordinary volume. Available at the BMA Shop October 2016. 20% discount off room rate of choice. Join today and enjoy free exhibition tickets, plus discounts at the BMA Shop, Gertrude’s restaurant, and several other neighborhood restaurants. Click here for a complete list of benefits. Matisse/Diebenkorn is co-organized by The Baltimore Museum of Art and the San Francisco Museum of Modern Art. The exhibition is curated in Baltimore by BMA Senior Curator of European Paintings & Sculpture Katy Rothkopf. Major support for Matisse/Diebenkorn has been provided by The Henry Luce Foundation and Terra Foundation for American Art. This exhibition is supported by an indemnity from the Federal Council on the Arts and the Humanities. The Baltimore presentation of the exhibition is made possible by Ellen W. P. Wasserman, Jeanette C. and Stanley H. Kimmel, Tony and Lynn Deering, and the National Endowment for the Arts. Corporate sponsorship is provided by Bank of America and Education Partner Transamerica. Home page left: Henri Matisse. The Yellow Dress. 1929-31. The Baltimore Museum of Art. ©2016 Succession H. Matisse / ARS, New York. Home page right: Richard Diebenkorn. Seated Figure with Hat. 1967. National Gallery of Art, Washington, D.C. ©2016 The Richard Diebenkorn Foundation. Above left: Henri Matisse. View of Notre Dame. 1914. The Museum of Modern Art, New York. ©2016 Succession H. Matisse / ARS, New York. 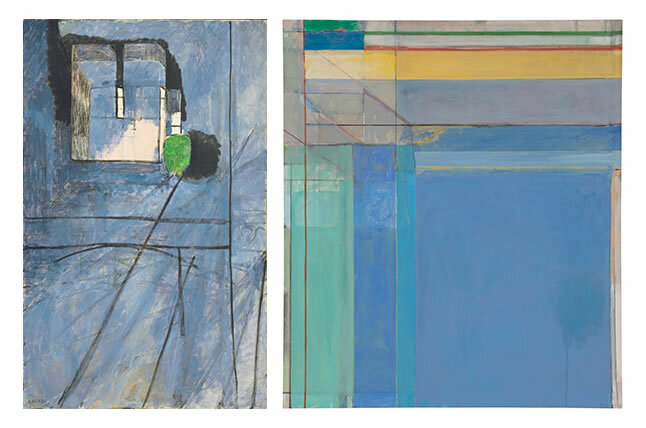 Above right: Richard Diebenkorn. Ocean Park #79. 1975. Philadelphia Museum of Art ©2016 The Richard Diebenkorn Foundation.